On Wednesday, the parliament of Nepal elected its first female president, according to the Associated Press. 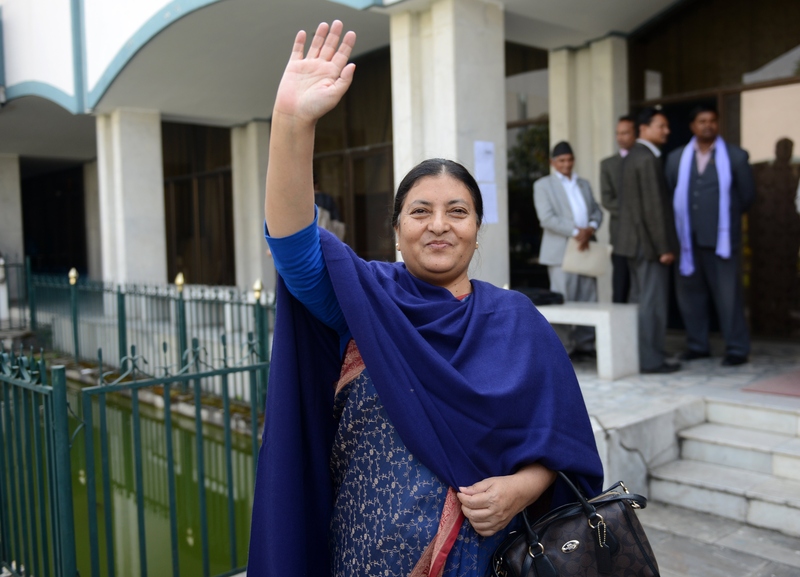 The first female Parliament speaker, Onsari Gharti, announced that Bidhya Devi Bhandari received 327 votes while her opponent received 214 in parliament on Wednesday. Bhandari, who has been a key activist in the push for women's rights in Nepal, is the nation's second president since abolishing its monarchy. Bhandari is the leader of the Communist Party of Nepal Unified Marxist-Leninist (CPN-UML). Her husband, Madan Bhandari, was a well known political figure, general secretary of the CPN-UML, and an activist who championed the "people's multiparty democracy," according to Wiki Nepal. Madan was also known as "the people's leader" because his goal for government believed that "social transformation in general is possible without the use of overt violence," according to Wiki Nepal. He advocated for "a people's peaceful revolution where justice would borne out of ballot, instead of bullet." In 1991, the two largest communist factions in Nepal became united and Madan led them. He openly criticized Nepal's then-King Birendra Bir Bikram Shah, asking him to give up his throne and enter into an election to allow people to choose their ruler. In 1993, Madan was traveling to a party meeting when his driver went off the road and plunged the car into the Trishuli River, according to Wiki Nepal. Madan and another passenger died, but Madan's driver lived. Many people in Nepal believe his death was actually a murder, and conspiracy theories have haunted his legacy. Ten years after the crash, his driver was murdered, fueling the controversy surrounding Madan's death. Shortly after her husband's death, Bhandari, a breast cancer survivor, became the first single woman to enter the political sphere in Nepal. Nepal adopted a new constitution last month that required it to elect a president, according to the Daily Mail. The president of the country acts more as a ceremonial head, while Nepal's prime minister will perform as the nation's leader. But that doesn't mean that Bhandari hasn't been doing her fair share of work. She was among the politicians who campaigned on a platform that ensured women's rights in the new constitution. Now, the document says that one-third of the members in parliament have to be women and either the president or vice president must be a woman, according to the Daily Mail. Bhandari's political experience doesn't stop at being a voice for women, though. She led demonstrations in 2006 against the then-King Gyanendra that finally ended his authoritarian rule and restored a democracy, according to the Daily Mail. Bhandari and Prime Minister Khadga Prasad Oli, who was elected earlier this month, are part of the second elected regime since Nepal abolished its monarchy. The last president, Ram Baran Yadav, was president for seven years because that's how long it took the country to prepare and adopt it's new constitution.